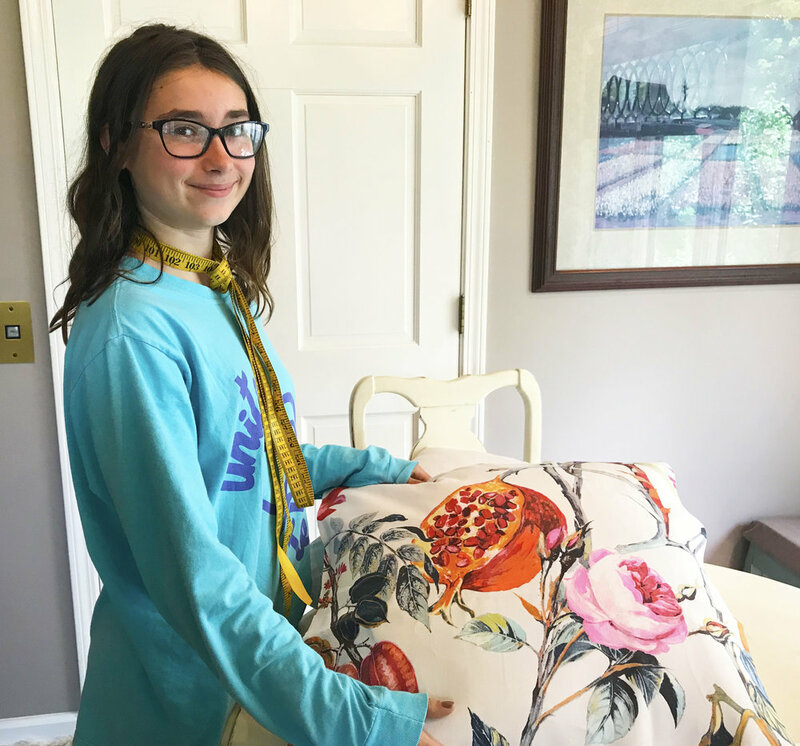 Even for folks who are not so craft-oriented recovering pillows is a basic skill level sewing project. 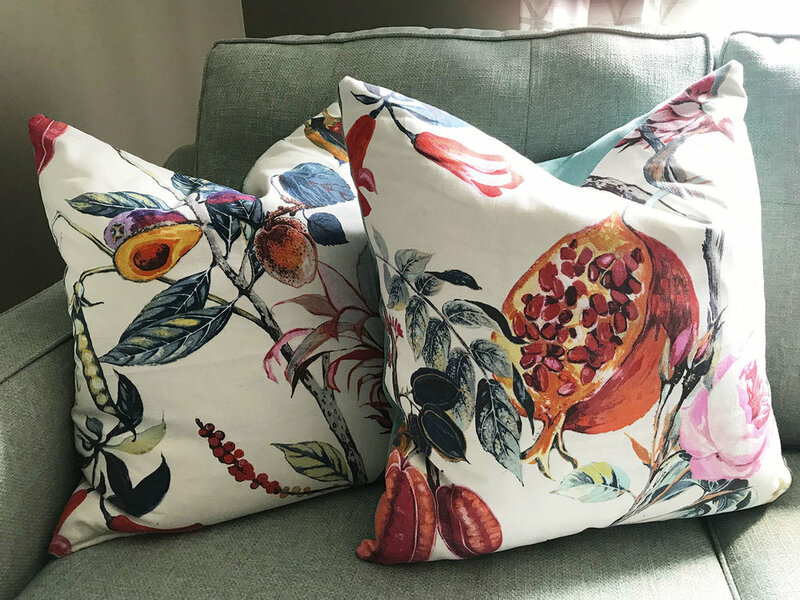 All you need is a sewing machine, some fabric, pillow forms, and a little bit of patience (actually, patience is optional). I had some beautiful woven Ikat feather pillows on my home office loveseat. 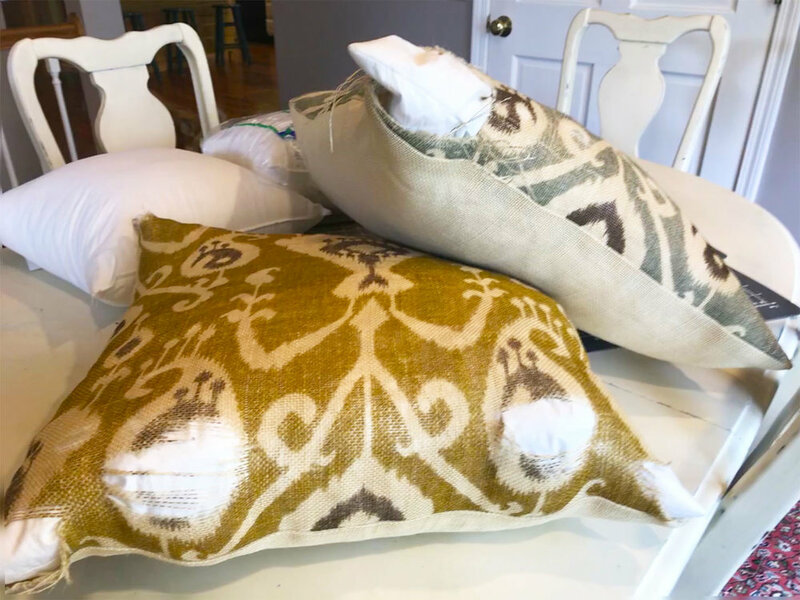 Unfortunately, because of the loose weave and high traffic area, the pillows had become frayed and torn. I let it go a little longer than I should have by carefully placing the pillows so the holes didn’t show. Finally, I had a day without much on the calendar, so I tackled the project. First things first, I gathered all the supplies. Creating pillow covers isn’t an exact science and can be roughed out and estimated a bit. If you are using pillows you already have around the house, they aren’t always a standard size. I always start by measuring the pillows so I know how much fabric I am going to need. With this project, I purchased two different types of fabric. A bold large scale floral print for the front and a soft solid for the back. I bought a yard of each to give me plenty of extra so I could carefully pick which part of the print I would like as the front of my pillow and to allow for waste. Use a fabric measuring tape to measure the pillows. If you don’t have a fabric measuring tape be sure to include a bit extra in your measurement to account for the loft. Once you have the pillow measurements include your seam allowance. Since I’m not a precision seamstress I always give myself 5/8” seam allowance. 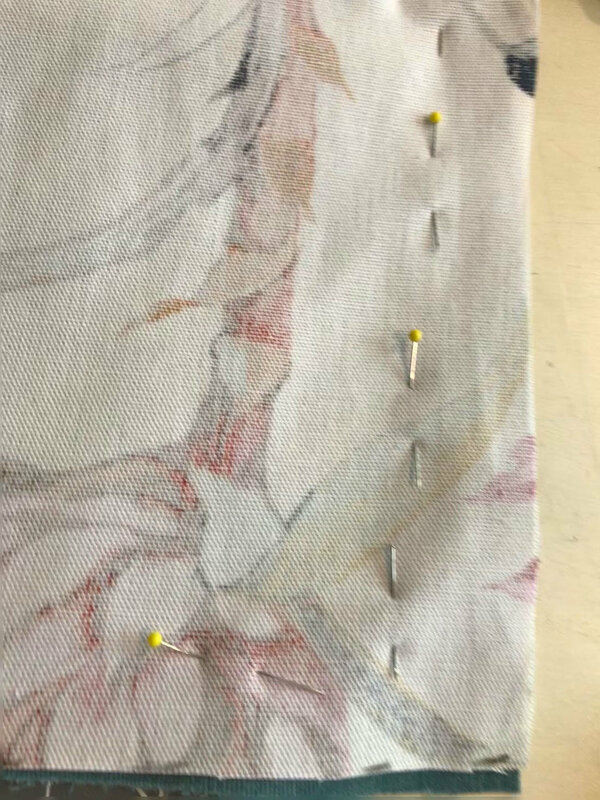 This is a standard seam allowance and is marked on all sewing machines, making it an easy one to keep track of as you sew. 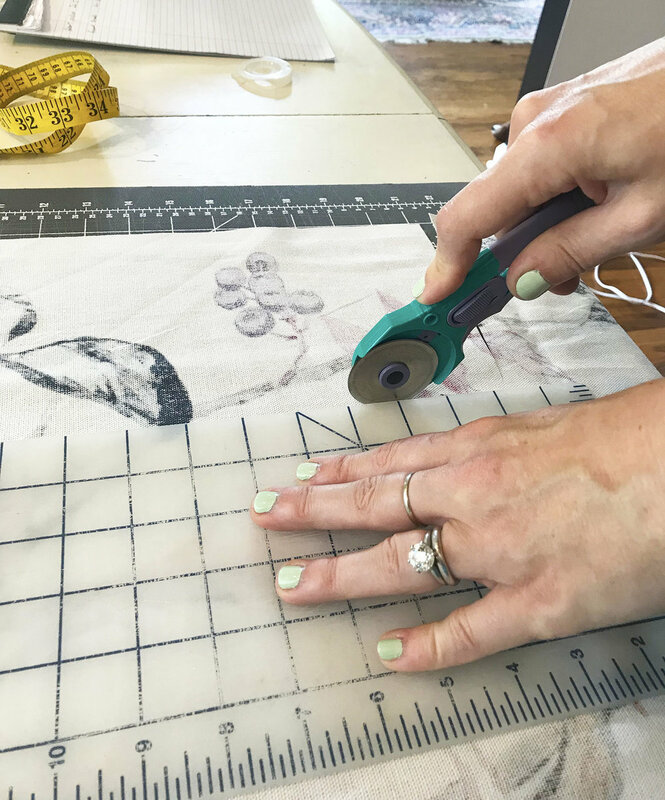 Now measure out your fabric. 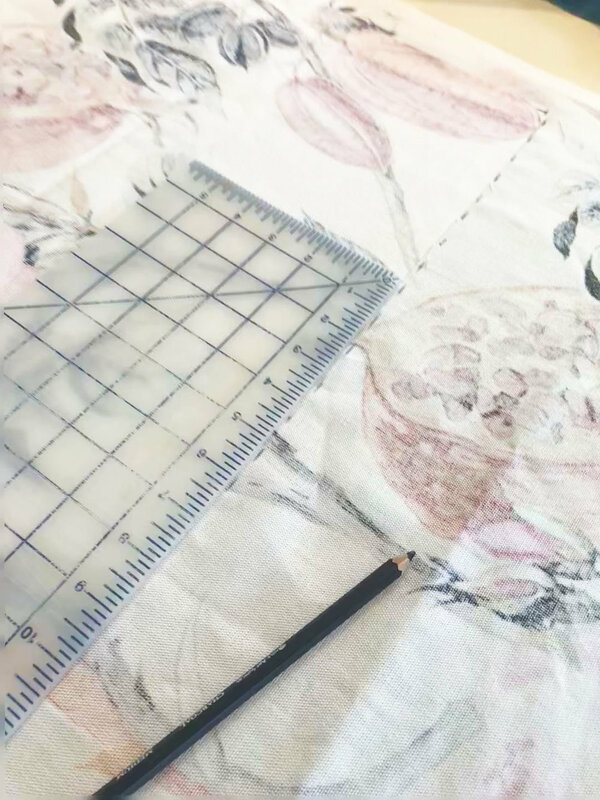 For the front of the pillow, you will measure the total width and height of the pillow plus the seam allowance will need to be added to each side. I usually use a charcoal pencil to mark my measurements. 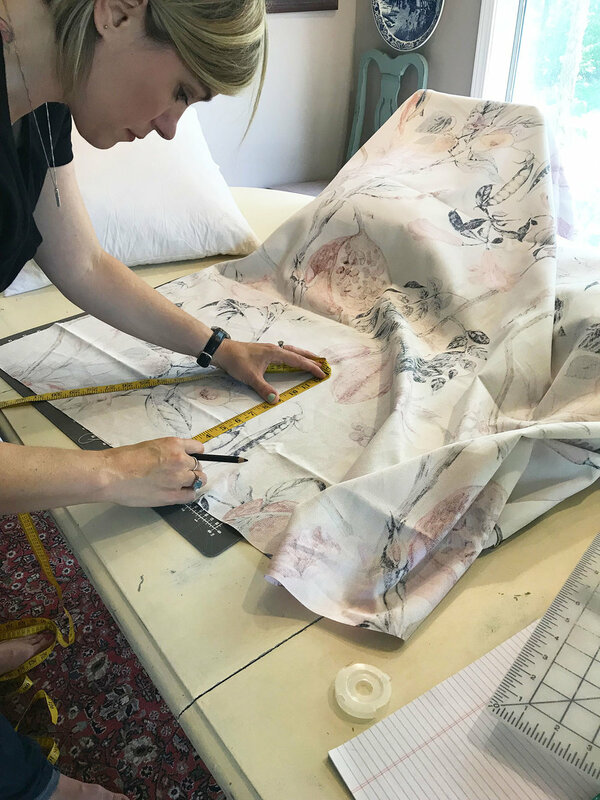 Make sure to trace your measurements on the back of the fabric, you won’t want to see any marks in the finished product. I have done a good deal of quilting, so I am in the habit of using a rotary cutter. If you prefer scissors they work just as well. Cut out your fabric but be careful not to pull on the fabric as your cutting. Keep the line straight and clean. For the back of the pillow you will be creating a flap where you can insert the pillow, so you will have two pieces instead of one, one larger than the other. You use the same pillow width including seam allowance for both pieces. 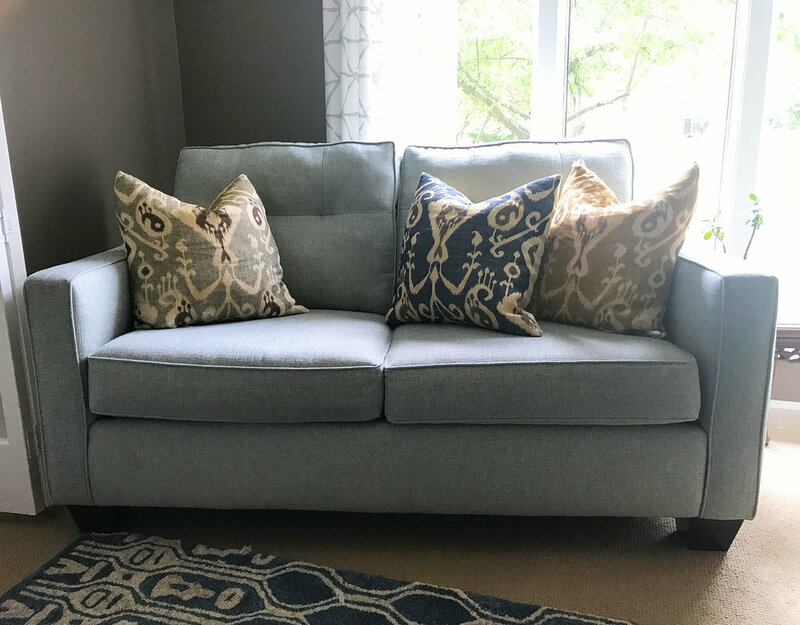 For the height, you will take half the pillow height including seam allowance then add 1.5” for the top piece and add another 5.5” to the bottom piece. The 4” is for an overhang and the 1.5” is to sew a hem. Once everything is cut you should have two large squares for the front (mine are the floral print) and four rectangles for the back, two smaller, two larger (for my pillows this fabric is solid). At this point make sure your sewing machine is set up, plugged in and threaded with the appropriate color thread. For this project, I used cream for the whole project. So, for those nifty flaps in the back to look tidy, you’ll want to add a hem to each. To do this take each of the rectangles and fold down one side 7/8”. 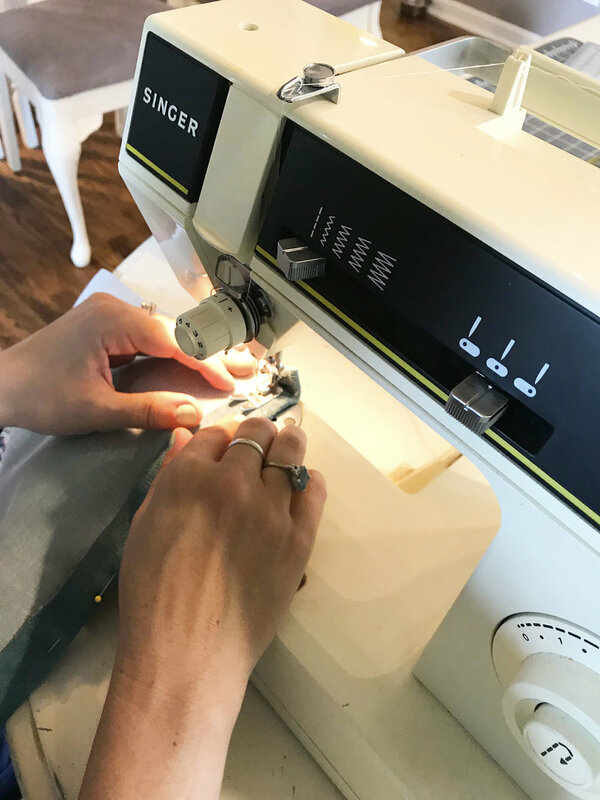 The side that you are sewing will be the horizontal measurement, so the width, not the height. As I mentioned before, this doesn’t have to be perfect, so fold it over enough so you can easily sew a 5/8” along the edge. After you have all the back flaps hemmed you can marry up the front and back fabrics. Don’t forget to have the nice side of the fabric facing inwards so you are looking at the back of the fabric. Pin together the unhemmed portions of the fabric making sure that one of the back flaps overlaps the 4” over the other then use pins to pin the fabric together. Take a moment to be sure that your fabric is all inside out and the back flaps are overlapped with the back of the hem facing out. The entire pillowcase will be sewn inside out then flipped when it’s finished. When the pillow is fully pinned, carefully sew all the sides. Be careful when you get to the sides with the overlap. This area will be thicker and might be harder to sew. Now comes the fun part. You get to take all the pins out, flip the case inside out and put in your pillow form. I use a pencil eraser tip to get the corners turned out nicely. I couldn’t be happier with my pillowcases. 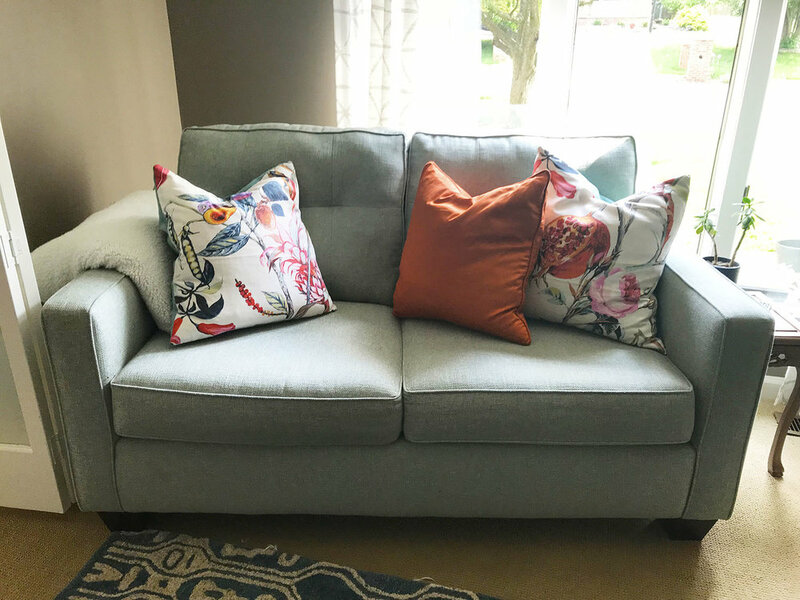 They add a fun pattern and great color to my space and were much cheaper than buying new. They are also easy to remove if I ever want to wash the covers or switch out with a similarly sized pillow. This story first appeared in the Herald Times on June 16th, 2018.